They say April showers bring May flowers, but as most mid-westerners know, the onset of spring means rain, thunderstorms, and sometimes even tornados. The folks in Ashby are already experiencing their first cyclone as it sweeps the stage in the Ashby Spring Musical production of The Magical Land of Oz Friday and Saturday, March 23-24. 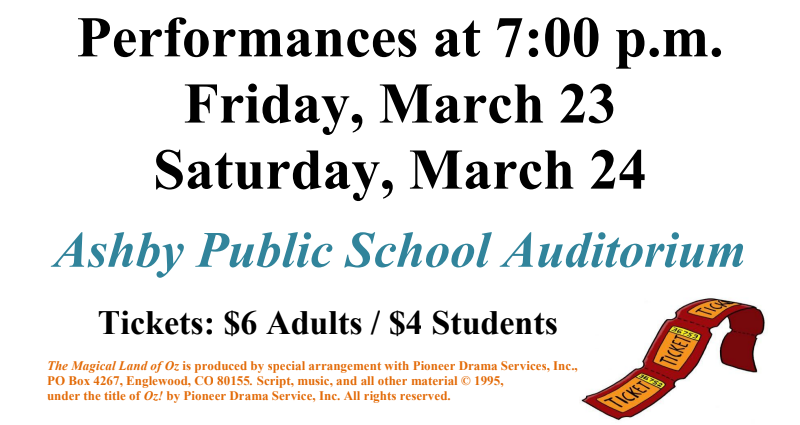 Performances will be held at 7:00 p.m. each evening, with tickets available at the door ($6 for adults/$4 for children). Starring as the beautiful, meek Dorothy is Josey Ness, accompanied by her faithful pup Toto played by Zach Fagre. As they make their way down the Yellow Brick Road, they encounter animated new friends including the Scarecrow portrayed by Maizy Spangler, the Tin Woodsman played by Aiden Bruck, and the lovable Cowardly Lion brought to life by Jacey Schlosser. From the start, audience members will be whisked up in the intensity of the cyclone, then landing in the colorful fantasy of the Magical Land of Oz. The auditorium be energized as they meet the Munchkins who encourage Dorothy to “Follow the Road,” under the guidance and protection of Glinda the Good, Witch of the North, portrayed by Abbi Evavold. Of course the road to Emerald City is not all sunshine and roses as our friends quickly realize. They stumble through the Forest of the Fighting Trees (Anna Thormodson and Maddie Bestul), encounter the Wicked Witch of the West, played by Caity Weaver, and her band of Flying Monkeys (Cailey Schlosser, Katie Bailey, McKenna Williams, Max Gronwold, and Sam Sorenson), and finally make their way to the Wizard of Oz (Miles Hoff), who won’t help them until they help him first. Over 40 young men and women have tapped into their thespian talents to participate in the production as either cast or crew. Cast members include seniors Sydney Jensen, Alyssa Malecha; juniors Aanika Anderson, Autum Bitzan; sophomores Maddie Bailey, Halle Dahlen, Sami Schlotfeld; ninth graders Bobby Anderson, Jade Bjornson, Ashley Hill, Kate Jensen, Madeline Thompson; eighth graders Lilly Evavold, Sam Heeter, Matson Hoff, Catherine Koefod, Celi Nelson, Evan Paulson, Raelynn Ripley, Mya Roley, Kaylee Schlundt; and seventh graders Ryleigh Brendmoen, Maddison Burak, Emma Erickson, Liberty Johnson, and Livy Johnson. Crew members working diligently behind-the-scenes include seniors Hannah Ras; juniors Dakota Ecker, Tanner Hart; ninth grader Ashton Ecker; eighth graders Kyra Aamot, Hunter Norby, Torin Olson, Carson Spangler, Carter Spangler; and seventh graders Brodie Ecker, Hannah Johnson, Karlie Maack, and Robert Nelson. 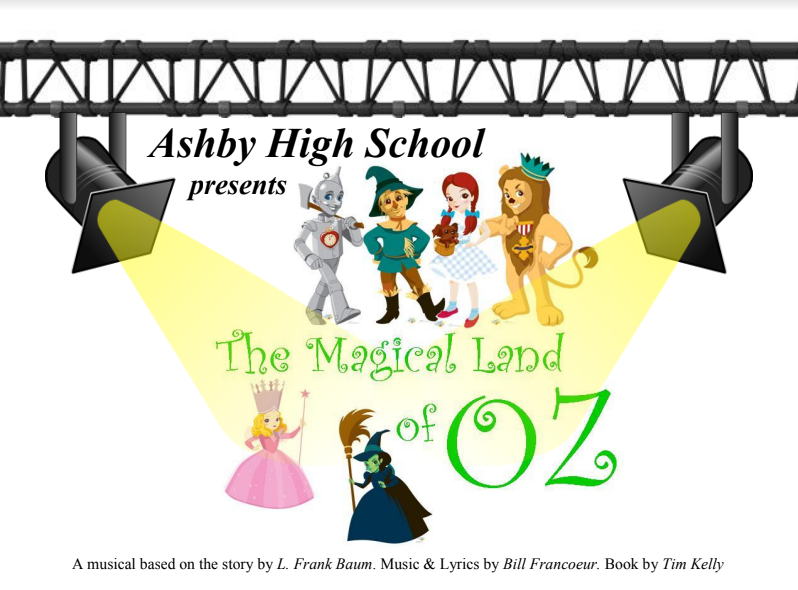 The Ashby Public School rendition of The Magical Land of Oz will sweep you off your feet. Please join in the journey of following you dreams and finding your way back home again.